Cookstown captain Greg Allen has set his team an ambitious target for the remainder of the Ulster Premier League campaign - win every match. And if they can achieve that, then the Tyrone side won’t be caught, after last Saturday’s 3-1 win over Annadale. The result was a nine-goal turnaround following the Dale’s crushing victory on Boxing Day. “We were devastated by the 8-1 loss in the Kirk Cup but we were determined not to let that result take us away from doing what makes us a good team, to play our game and not let the idea of revenge get to us,” said Allen. “I am delighted that we were able to get the win even if we were a little bit wasteful in the first half. 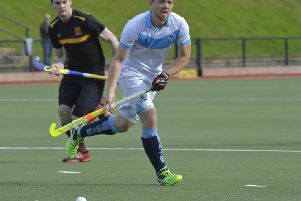 “We really wanted to win a medal on Boxing Day, but this result is probably the more important if we want to get ourselves back into the EY Hockey League. “What I will be telling our lads from now on is that the job isn’t over and all we have done is put ourselves in the driving seat so we cannot be negligent. Cookstown face North Down in Comber on Saturday, weather permitting while Annadale host Portadown. Dale are likely to be without player-coach, Peter Caruth, who missed Saturday’s game through an ankle injury. Callum Robson could be out for much longer after also picking up a knock on Boxing Day. “We were disappointed with Saturday’s result but expected a difficult time especially with so many schoolboys on their second game of the day and injuries to key players,” said Dale director of coaching Andrew Smyth. “Cookstown’s celebrations showed how much they felt it mattered in the race for the league and for me they are clear favourites with a game in hand.